Ironman Copenhagen was the second European Ironman race of the weekend. 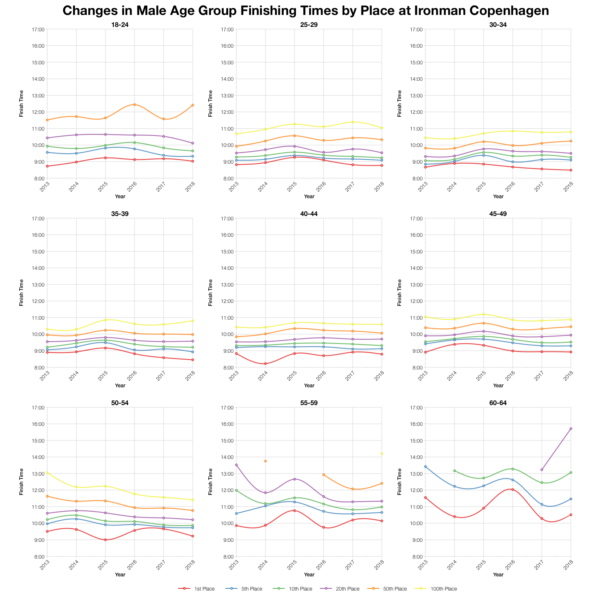 Copenhagen has a relatively fast course and draws a large field of athletes. It offers the standard 40 age group Kona slots. this year’s race looks to have been typical for the course – trending closely with previous years. 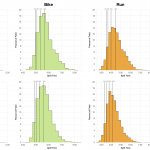 This year’s distributions are remarkably similar to the amalgamated results from the previous 5 years. It’s not often the charts so closely mirror each other. There’s likely more variation when you look up close, but overall this year was much the same as previous ones. 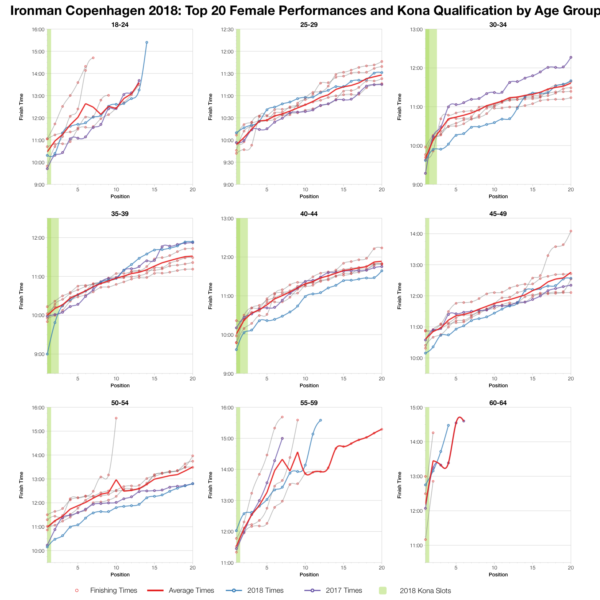 The DNF numbers from this year’s race also fall in the middle ground – neither high nor low, and by wider Ironman standards unexceptional. 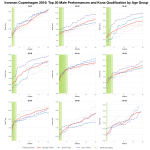 As we look in more detail – at individual age group medians you see the variations. 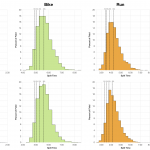 Instances where swim, run or bike are faster or slower. 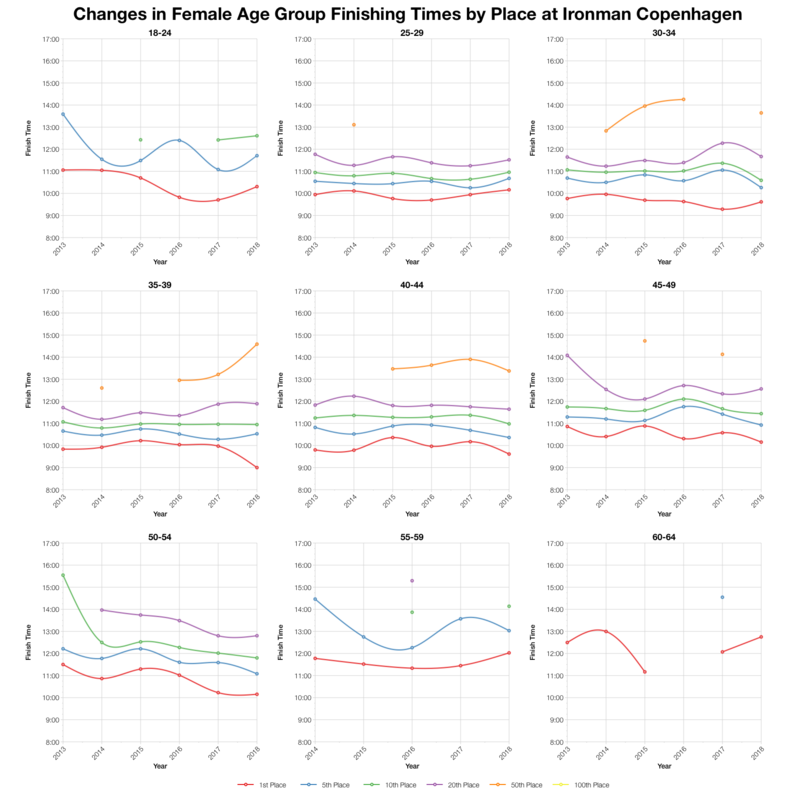 In general the differences are small and the direction of change varies for age groups rather than showing a clear pattern. 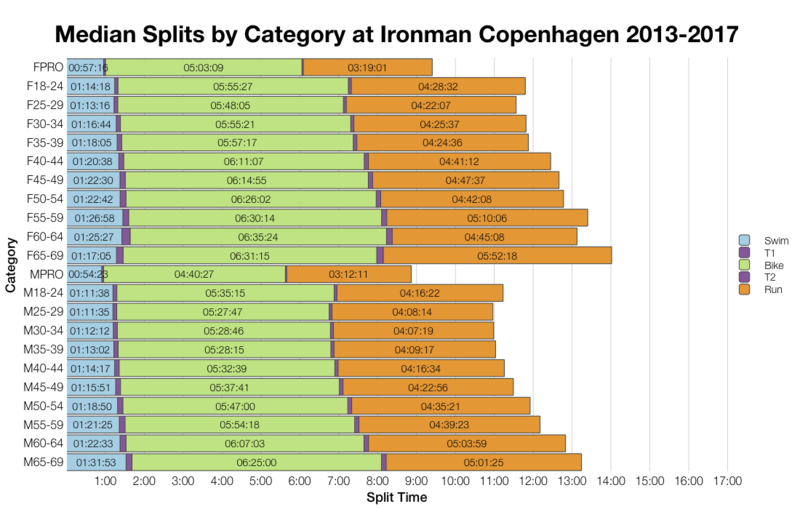 Copenhagen draws a broader field of athletes than the nearby Swedish race, with only 40% of racers coming from Denmark. About half the slots remain local with the rest spread to other nationalities. 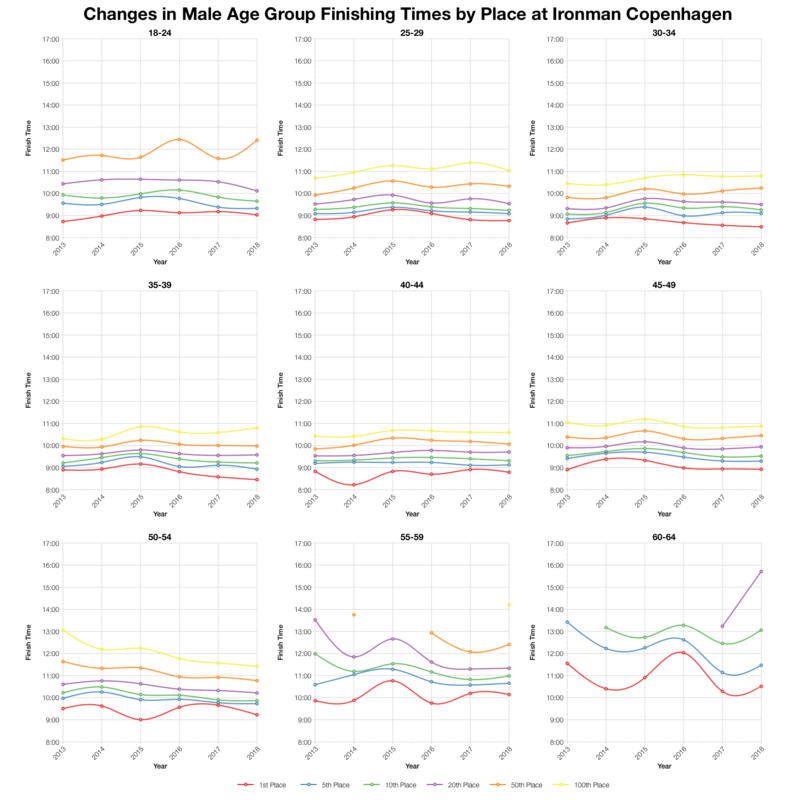 Tracking times for specific positions within each age group shows how consistent Copenhagen has been over the years. If anything the most variation appears to come with age group winners. Still, these differences are mostly minor. 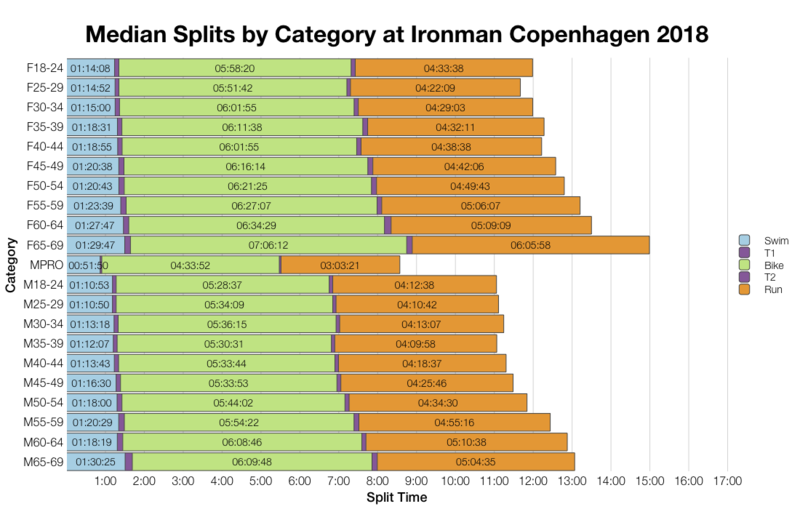 Based on the start numbers I’ve estimated the slot allocation and from that the likely automatic qualification times at Ironman Copenhagen. Final numbers will vary and roll down will affect the actual qualification times. 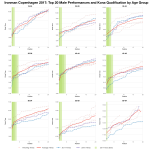 You can compare this with other races at my Kona qualification page. When we look more closely at the top twenty within each age group we tend to see times that are average or better for the course. For the very front of the race it appears this was a slightly faster day. For those looking to qualifying this was actually one of the fastest years. 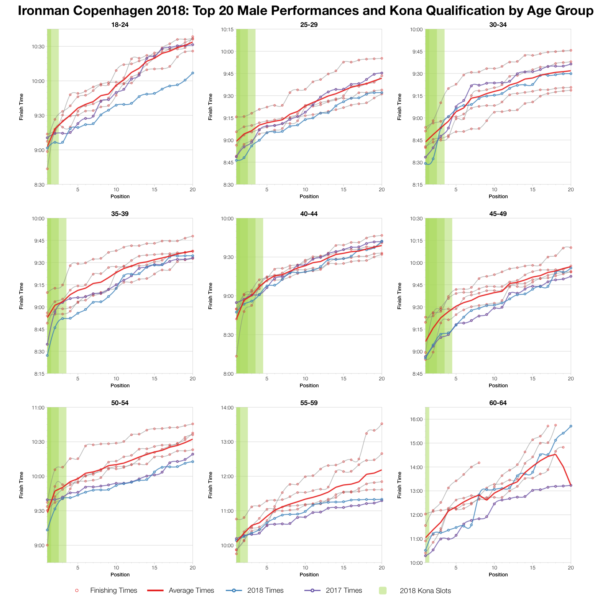 You can access a spreadsheet of the full results from Ironman Copenhagen 2018 on my Google Drive.